The latest guide features our Zero Waste League superheroes: Kilowatt Kid, who fights energy waste; Eco-Elf, who reminds you how to live green; Green Star, who spreads Zero Waste practices through the community; Captain Zero Waste, the reducing, reusing, recycling, and composting expert; and Wonder Wormy, a soil-making wonder. Click inside the box to enlarge. Click the right and left arrows to turn pages. 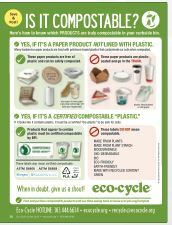 The Eco-Cycle Guide can be found in print at the CHaRM (Center for Hard-to-Recycle Materials) and at local coffee shops and stores throughout Boulder County. 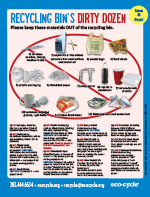 It contains more than seven Zero Waste Guidelines posters, including our "Is it compostable?" 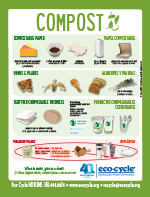 handout for deciphering which products are truly safe for composting curbside, and the most recent recycling guidelines for Boulder County. 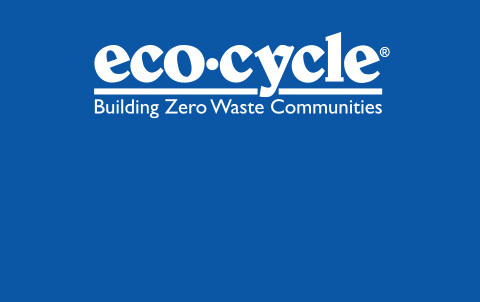 Eco-Cycle operates the county-owned Boulder County Recycling Center. To help distribute the Eco-Cycle Guide in your neighborhood, sign up to be a volunteer Eco-Leader. >> Subscribe to the Eco-Cycle Guide and Eco-Cycle Times online. 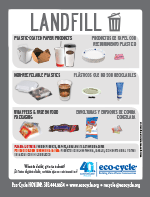 Help us distribute the Eco-Cycle Guide! The Eco-Cycle Guide is distributed throughout Boulder County by hundreds of Eco-Cycle Eco-Leaders. These volunteers help neighbors, coworkers, church members and others in their community learn the ins and outs of recycling, composting, waste reduction and other environmental issues. If you would like to join the Eco-Cycle Network, call 303-444-6634 or email us. Sign up to receive e-mail alerts for when the latest Eco-Cycle Guide becomes available or stay in touch with Eco-Cycle through our many other email updates.